We have just released Banshee 1.0 Beta 1, aka 0.99.1! This release adds some major features and lots of polish. Extensions can be enabled and disabled in the new Mange Extensions tab within your Preferences. This release also features default smart playlists, created for new users and users with zero smart playlists. There is a more extensive list of predefined smart playlists, including the defaults, available in the New Smart Playlist dialog. Thanks to Aaron Bockover, Alexander Hixon, Bertrand Lorentz, Christopher Rogers, Scott Peterson, Sebastian Dröge, and Wouter Bolsterlee for code contributions for this release, and to Daniel Nylander (sv), Gabor Kelemen (hu), Jordi Mas (ca), and Wouter Bolsterlee (nl) for updated translations! And to Jorge Castro for testing and release notes help, and Michael Monreal and Andrew Conkling for testing and bugzilla work! You can follow the posts of Banshee contributors on Planet Banshee. We are a friendly, vibrant community and always glad to have people join us! If you have been wanting to contribute back to free software and GNOME, I think you'll find Banshee's code and C# a pleasure to work in, and a healthy amount of support and encouragement from a very active community. Join us on our mailing list, in our IRC chatroom, and on our wiki! Digg It! Thanks but you guys missed the boat by not having an option to show the video files list as thumbnails. On the fly encoding? I think I am going to cry. I believe this makes Banshee the first player ever to support this. This sounds like there's now finally a sane way to use sync my iPod. @anon2: Glad you like it; Banshee has had it for quite a while though (in 0.13.2 and before). It does work better than ever though! But is there a way to use this new version on ubuntu hardy? @anonymous: The PPA will be updated soon, I imagine. PPA updated! For Ubuntu Hardy anyway. Gutsy source package has been uploaded, amd64 and lpia builds already available but for some reason i386 waits longer in the queue. @last anon: Thanks for the reminder, the Roadmap is updated! Oh boy. :D Exciting news! If iPhones and Podcasts work, I'm switching my girlfriend to Ubuntu. A great release, but banshee is still unworkable for me because of the lack of support for compilation albums. At the moment, both my artists browser as well as my album browser are completely clogged up by artists from a compilation and the albums are displayed by artist, so one compilation album is displayed 20 times per album : it is unworkable. I would like to see a system as in amarok, wich groups all compilation album artists into "various" and only shows every album once in the browser. But as for the rest: great work! - Adding a podcast http://feeds.feedburner.com/NeverNotFunny crashes Banshee. - Play a video and rapidly switch between all navigation places (music, podcasts, recently added, playing now, video library, etc). Somewhen, the window will freeze up and only show the video instead of the expected stuff, or the "Playing now"-window will stay permanently black. - Inserting an iPod Nano2 does not do anything in Banshee (Ubunu Hardy; it works fine in Rhythmbox). - Add new music. Go to "unlistened" and double click any song. Now doubleclick any song below it. Graphical error (wrong track has highlighted border). - Un-fullscreen Banshee and start a video so that black bars show on top&bottom. Go fullscreen. Now exit fullscreen. Notice the artifacts at the top and the bottom. - Adding an album and autodownloading the cover resulted in an incomplete icon (bottom part is gray) in the album-column (when I play the song though, the icon is fine in the top bar) and I see no way to fix it. - .mkv videos (720p files that work fine in Nautlius) show an error ("unsupported file"). - How about automatic renaming and moving tracks (iTunes can do this - and I like it only because of that and because my iPod needs it). Maybe an option "passive mode" (the way Banshee is now) and "aggressive mode" (retags mp3s on the go) would be clever. 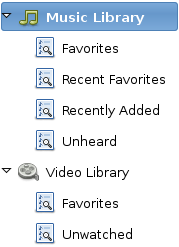 - How about auto-detecting the Episode/Season/Title of videos by name? Also I do not have Album names for movies or so. - Are videos included in Last.fm? I dont want to list my movies there. - Wont last.fm album-icons clog up my drive? - "Playing now" could show the album art (+apple shadow effect) when playing music. - Please use system icons, the blue color of those playlist icons does not match with the default Ubuntu style. - Since movies are usually a lot longer than music, add an extra seek-bar to the bottom of the "playing now" screen to make more precise naviagtion possible. - Please add an compilation tag, or join multiple albums with the same name in album view. - Double clicking the video should fullscreen the video. 1. When a new song starts playing the list should scroll down to the song..
2. When I plug in my (MTP) Samsung T9 Banshee says it only supports one MTP device at a time. I second gijs' idea. It is very inconvenient to have to scroll through so many albums with the same.